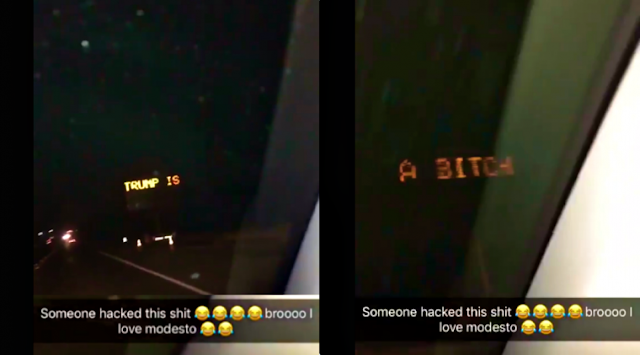 Someone in Modesto city, California on September 11 hacked and defaced an electronic road sign with an anti-Trump message. The first person to notice the deface was Makayla Victoria, a resident of Modesto who posted a short video clip on her Twitter page showing the message "Trump is a B*tch"
"Well, you know, i think the message could have been seen as light-hearted," Stanislaus County Public Works Director Matt Machado told Scaramento saying that this kind of experience was his first in his 10 years on the job. "We have typos from time to time, contractors will type in a word wrong, but you can see the intent is there, just a misspelling," Machado said. He went on to raise concern over how road signs could be easily hacked and how they pose a danger to motorists and pedestrian. "Absolutely, that's a concern, and so we'll be chatting with our contractor to have better protective measures in place, because if bolt cutters will get you in that's not good enough," Machado added. So far the highway staff can't fix the problem until replacement part arrive.